Do you find yourself in need of a standard Firewire 400/800 extension solution, but also occasionally wishing for a Firewire data relay solution that can go much farther than the usual extension distances when necessary? Gefen's Firewire 800 Extender Plus may be an ideal solution because it does both duties in a modular way. 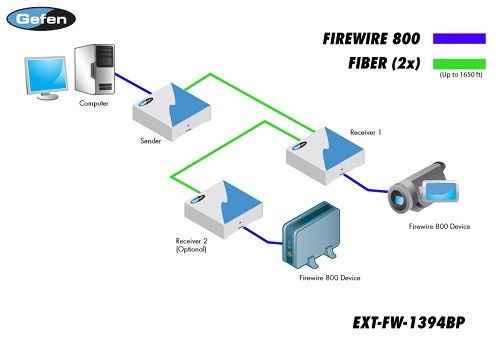 With the Gefen Firewire 800 Extender Plus, you can remotely access your Firewire devices such as Firewire hard drives and Firewire cameras as if they were connected locally. The Gefen Firewire 800 Extender Plus gives you standard 500-meter signal relay at a blistering 800 Mbps plus a powerful additional bonus: the ability to network (or "daisy chain") transceivers to get a much longer total extension than usually possible with Firewire extenders. Firewire data relay networks of up to 18 miles can be created in this way. The Gefen Firewire Extender 800 Sender device connects to your computer or other master Firewire device at your work area. The first fiber optic cable (up to 500m) runs from the Gefen Firewire Extender Sender to a Gefen Firewire 800 Receiver. If a greater extension is desired, this receiver can act as a sender and be connected to its own next receiver, terminating when the desired distance is reached. Up to 63 receivers may be connected in this kind of "daisy chain" topology to create very long Firewire 400/800 signal extensions. Note: Intermediate units in a "daisy chain" topology must be powered in order to carry the signal.Up to 63 units may be connected in a "daisy chain" to create very long signal extensions.